I discovered this bier around three years ago, fairly early in my craft beer journey. At that time I thought it was the best beer I had ever had. It really opened my eyes and helped me see the complexities of the great world of Belgian Ales. Since then I have had a multitude of Belgians in many different styles. Although I have had several Belgians that I liked better than this one it is still one of my favorite Belgian Christmas Ales. It will be interesting to see how it holds up to some of the others that I will be reviewing this Christmas Season. The bier pours a very dark amber almost brown with reddish hues and a rich off white almost tan head. Rich roasted malts with a yeasty background on the nose, there is also some spice and slight citrus aromas. Oh, smooth rich and creamy. The taste starts with sweet roasted malts then a nice effervescence. The back end has more sweet malts with a creamy mouthfeel. The finish is slightly spicy and dryer finish with slight citrus notes. The final finish leaves you with a smooth creamy mouthfeel and a wonderfully malty sweetness. This bier really opens up as it warms. This is one smooth and rich Belgian dark. The wonderful Belgian complexities are really more pronounced at warmer temperatures. This is one of those Belgians that you start to pick up different notes as it warms. It is much smoother now and the spices are a little more pronounced at warmer temperatures. I assume the smoothness has a lot to do with less carbonation and the increased maltiness at this warmer temperature. Smooth rich and creamy with just a light touch of spices all in that classic bready yeasty Belgian backbone. Malty Goodness just about sums this one up. I must say that I am not as fond of this beer as I once was. Either this particular batch is not as good or I have just had better Belgian Christmas Ales lately. All and all this is still an excellent ale and I can’t find anything wrong with it. 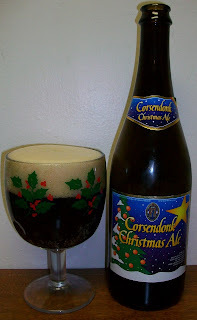 I just think that there are better more complex Belgians Christmas Ales out there.